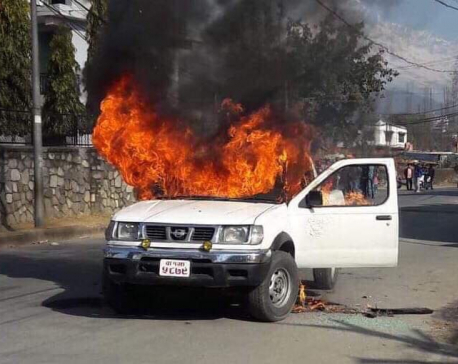 KATHMANDU, Feb 3: Cadres of Nepal Student Union (NSU), the student wing of the main opposition party Nepali Congress (NC) on Saturday torched four government vehicles and took scores of others in control in line with their program of taking government vehicles running on Saturday in control. NSU had run a nationwide campaign of taking such vehicles in control on Saturday till 5 pm in order to stop the misuse of the government vehicles on holidays. The Metropolitan police Range Office (MPRO), Kathmandu informed Republica that the vehicle did not suffer any major damage. Chief of the MPRO, Senior Superintendent of Police (SSP) Basant Lama said that in the end, the vehicle was in the condition to be driven. “Since the vehicle did not suffer much damage, the driver was able to drive the vehicle away from the site,” he said, “We were lucky since there was a water tank nearby.” He added that the NSU cadres had seized the key of five government vehicles including one from the Prime Minister’s office in Kathmandu on Saturday. He also said that the NSU cadres have handed the keys of the vehicles to the traffic police office. Similarly, NSU cadres also torched a pickup vehicle belonging to the Pokhara Metropolitan City (PMC) on Saturday morning. According to the District Police Office (DPO), Kaski, two NSU cadres on a scooter stopped the vehicle (Ba 1 Jha 5879) when it was plying a road in PMC-7, Masbar and torched it. Spokesperson for Nepal Police SSP Uttam Raj Subedi said that five NSU cadres have been arrested in connection with the incident. The DPO, Kaski, has said that Rajendra Baral, Difan Bhujel, and Laxmi Paudel were among the cadres arrested from a hotel at Lakeside, Pokhara. SSP Subedi also informed Republica that two government motorcycles were also torched by NSU cadres on Saturday. 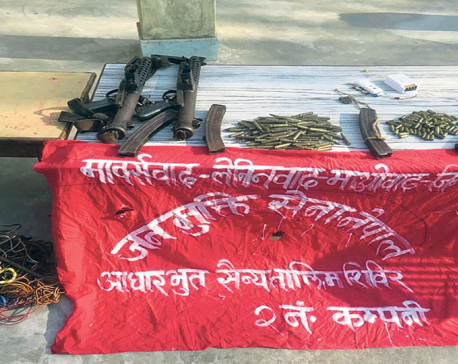 “NSU cadres torched a motorcycle of the District Health Office of Nepalgunj,” he said, “They also set a motorcycle belonging to Guras Rural Municipality-3, of Surkhet on fire.” He added that the student body has already returned the keys of the vehicles to nearby traffic police offices. Officials from the NSU have claimed that the student organization did not intend to torch the vehicles and was just trying to take them in control. President of the NSU, Nain Singh Mahar told Republica that the organization is very sorry for the ‘unintended’ incidents that took place. When asked what the student union has to say about such irresponsible behavior of its cadres, Mahar plainly claimed that such incidents take place sometimes and that it was very unfortunate that it took place. Mahar said that the campaign ended at 5 pm on Saturday.